Heat waffles in a toaster. Spread Smart Balance on waffles. 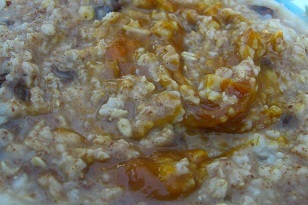 Top with chopped pear and almonds. Serving suggestion: Serve with a cup of cold, fat free milk. Sweet and salty. 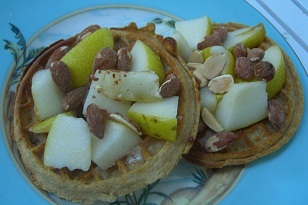 I like the contrast of the cold pear and warm waffle. Nutrition note: A balanced breakfast is a great way to start your day! This meal provides protein (from the almonds and some from the waffles) and lots of fiber (from the pears, waffles, and almonds) to keep you full and satisfied longer. Pre-heat a large frying pan on the stove on medium-high heat. Slice polenta into 1/2 inch thick circles. Pour oil in the pan. Carefully place slices in the pan. Heat for about 6 minutes or until lightly browned. Flip. Cook for an additional 6 minutes or until lightly browned. 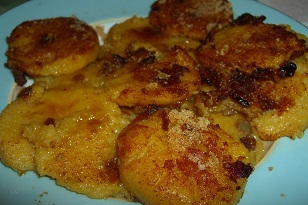 Sprinkle with cinnamon and brown sugar. 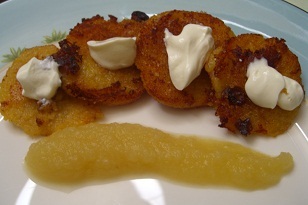 Top with sour cream and dip in apple sauce. Enjoy! Tastes like a combination between sweet cinnamon raisin bread, latkes, and cinnamon rolls. It was so good, we were looking for more. Nutrition note: Consider making a healthy substitute in your cooking by replacing butter with healthy oils, like canola oil. Over time, a lot of saturated fat in foods like butter can make your arteries less elastic and make blood flow more difficult. 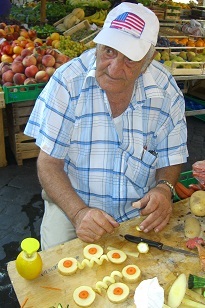 Jamie says: The little, old Italian man at the market in Campo De Fiori in Rome, Italy was so cute making exciting shapes out of veggies that I had to spend too much (15 Euros) on the plastic cooking tools he was selling. But, hey, he gave me a “student discount,” and my gosh, the one thing could juice and the other tool could peel AND cut… might as well get all four pieces. Mom and I had fun making these Zucchini Curls at home, but we soon realized the old man sure did a better job. Use a cooking tool to cut curls of zucchini. Place pieces in a large pan and drizzle with canola oil. Sprinkle seasoning on top. Mix well. Pull curls apart and place other pieces of zucchini in between so zucchini cooks evenly and quickly. Bake for about 20 minutes or until soft. Enjoy! 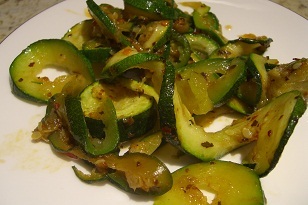 The seasoning made the zucchini very flavorful and had a nice spicy kick to it. It was fun to eat curls of zucchini instead of the traditional circles. Nutrition note: Make veggies fun to eat by cutting them into different shapes, like curls. Kathryn says: Happy Fall! J came home with a Starbucks Pumpkin Spice Frappuccino yesterday, and it made me want to cook with pumpkin. 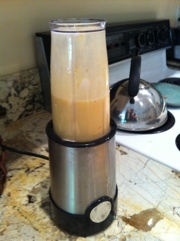 I woke up this morning and put this tasty shake together with what we had around the house. I like to call it a PB&C Shake. Blend until ice is fully blended. 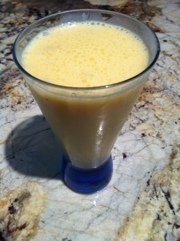 Pour into cup and enjoy as a breakfast drink, snack or dessert. 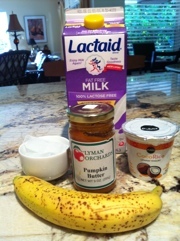 J’s nutrition note: Using yogurt as a base for shakes adds calcium, which helps maintain strong bones. 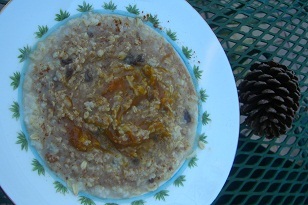 In a microwave-safe bowl, add oatmeal, water, and raisins. Microwave for 3 minutes. Stir in pumpkin pie spice and pumpkin butter. Top with milk. Enjoy! Variation: Try toasted walnuts on top. Full of fall flavor and perfectly sweetened! Tastes like pumpkin pie filling! Nutrition note: Pumpkin is a great source of vitamin A (in the form of beta carotene). Vitamin A is important for vision. Kathryn says: Having just returned from a two-week vacation in Italy, I certainly miss the food. Thankfully, I can incorporate some of those delicious Italian flavors into my cooking…like olives. Wash spinach and microwave it for about 45 seconds. 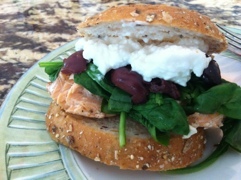 Place salmon and spinach on bread. Top with cottage cheese and olives. Add ketchup if you’d like. J’s nutrition note: Olives contain mono-unsaturated fats and salmon contains omega-3 fatty acids, both of which are heart healthy. Wash escarole. Place on a clean dish towel and pat dry. Tear escarole into pieces about 2″ long and place in a serving bowl. Juice lemon. Add juice and pulp to escarole. Toss. Add olive oil and sea salt. Toss. Peel garlic. Using a garlic press, press garlic into salad. With a knife, cut remaining garlic in press and add to salad. Toss. 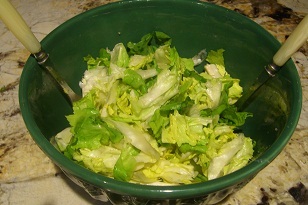 The raw garlic and escarole make this a tasty, bitter salad. The sea salt enhances the flavor. If I were in Italy, I’d say “molto buono,” meaning very good! Nutrition note: Vitamin A (in the form of beta carotene) isn’t only found in orange fruits and vegetables. Green leafy vegetables, like escarole, are a good source, too.